I believe that their next 45s came from a session in 1965 organized by the state’s ubiquitous Reginald Hines but almost certainly recorded in New Orleans. 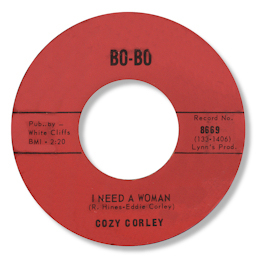 Corley’s own 45 on Bo-Bo featured a fine deep soul item I Need A Woman which showed off his gruff no nonsense vocals to very good effect. Judging by the matrix numbers this was a split session but Carolyn’s single (now under the surname “Faye”) came out on Reginald. Both sides of this very rare 45 are ballads with That’s All I Need Baby being perhaps the better one thanks to the fine chord changes and a really confident surging vocal. But “Oh Baby I’m Yours” is almost as good. 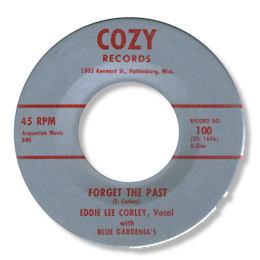 Around this time Corley also put out a release on his own home town Cozy label. Forget The Past is a classic southern soul deep ballad led by a guitar playing arpeggios and backed by some fine horns and a chanting female chorus. But the best part is undoubtedly Corley’s very committed vocal. The band’s last recordings seem to have been the ones they cut for Malaco. The original company that Tommy Couch and Mitchell Malouf established was a booking agency, Malaco Attractions, and the Blue Gardenias were among the local acts that they handled. And so it was a natural progression for them also to be amongst the first artists to record at the Malaco studio when it opened in the autumn of 1967. 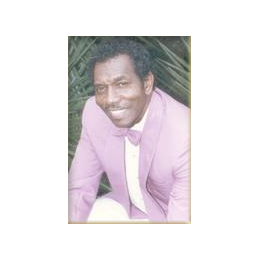 Warm Loving Man came from one of several sessions Corley had in Jackson in ’67 and early ’68. A super ballad with Fay’s strong lead well to the fore, the rather charmingly “amateur” sound, particularly the horns, only adds to the attraction of the track. 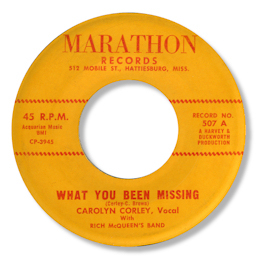 An authentic southern soul gem, it was a big regional success when it became the first 45 on the Malaco label. Rather surprisingly, Faye wasn’t featured on Corley’s second release from around the same time but I Love You is another very fine piece indeed. Corley’s pleading vocal carries considerable weight. Both it and the excellent uptempo “It’s All Over” benefitted from the considerably better production values that Malaco gave them, even in such early days. There may be other recordings made by the Blue Gardenias waiting to be found – I hope so. Meanwhile I’m delighted to be able to say that they seem to be going still going strong as you can see here. UPDATE ~ I'm delighted to say that Eddie Corley has been in touch. He writes "'I truly appreciate you for finding these songs that Carolyn Faye and Eddie Cozy Corley and the Blue Gardenia Band recorded in the early 60 & 70. I have not heard these songs in years. It bring back memory and many happy moments in our quest to succeed in the music world. Thanks for all you do for musical legends and artists." How kind of him. Note ~ "Warm Loving Man" can be found on the Grapevine 2000 CD "Troubled Waters".